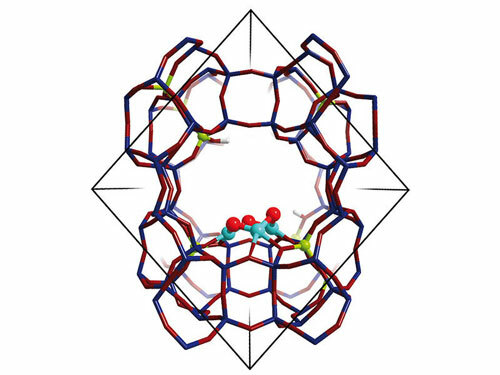 (Nanowerk News) A new bio-inspired zeolite catalyst, developed by an international team with researchers from Technische Universität München (TUM), Eindhoven University of Technology and University of Amsterdam, might pave the way to small scale 'gas-to-liquid' technologies converting natural gas to fuels and starting materials for the chemical industry. Investigating the mechanism of the selective oxidation of methane to methanol they identified a copper-oxo-cluster as the active center inside the zeolite micropores. A research team combining the expertise of Moniek Tromp (UvA/HIMS), Evgeny Pidko and Emiel Hensen (Eindhoven University of Technology), Maricruz Sanches-Sanches (Technische Universität München) as well as Johannes Lercher (Technische Universität München and Pacific Northwest National Laboratory) is currently focusing on a bio-inspired method enabling such partial methane oxidation. In their actual publication in Nature Communications ("Single-site trinuclear copper oxygen clusters in mordenite for selective conversion of methane to methanol") the researchers provide an unprecedented and detailed molecular insight in the way the zeolite mimics the active site of the enzyme methane monooxygenase (MMO).